American DJ Dotz Matrix DJParts - All Variety of Parts that DJ Needs. ADJ’s Dotz Matrix is a Wash/Blinder fixture with advanced COB LED technology allowing for a powerful LED engine to be placed in a small amount of space. 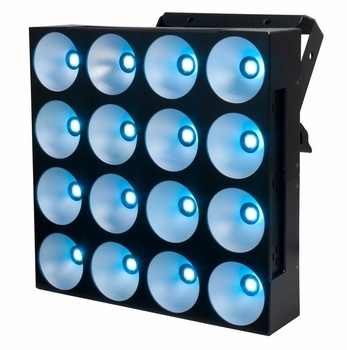 The result is a super-charged, high output, wash fixture with smooth color mixing powered by sixteen 30W TRI COB LEDs. Dotz Matrix also has Pixel Mapping capabilities for stunning visual effects, and boasts a powerful 430 Watts with a massive 60 degree beam angle. 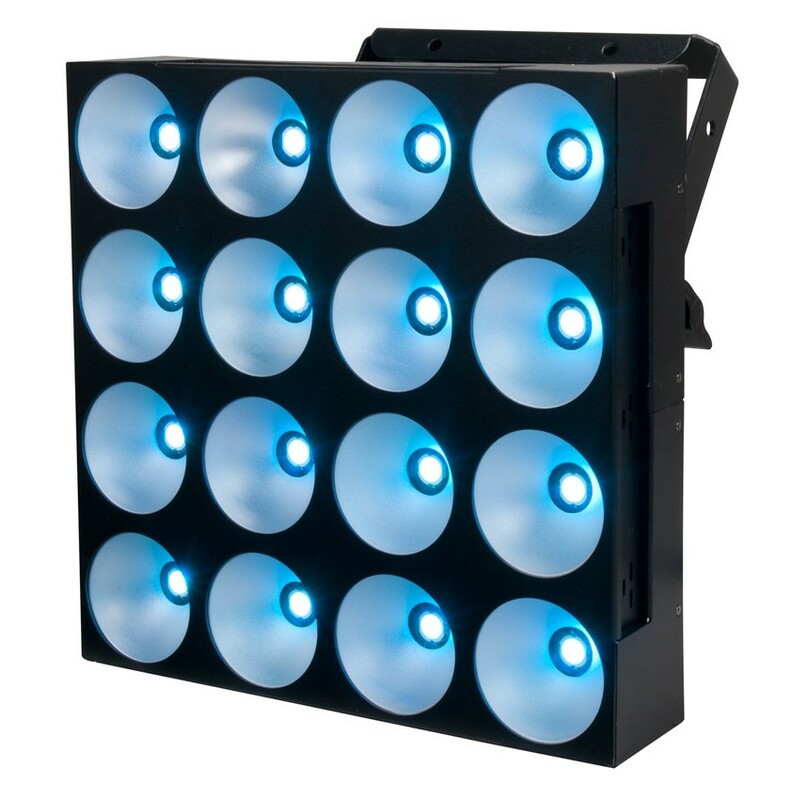 The fixture has many pro features such as: 0-100% electronic dimming, strobe/pulse effect, built-in shows and colors macros, a 4-button DMX LCD display, PowerCon AC In/Out, 5 selectable Dim Curves for stage lighting, 4 Pixel Flipping options, and 5 DMX channel modes. Dotz Matrix may run in its stand-alone mode from built-in programs, sound actively, or from a DMX Controller. Specifications • 4 x 4 COB LED high output Wash/Blinder Matrix panel • COB Technology (Chip On Board) produces powerful, smooth RGB color mixing with rich palettes of color • Use as Wash/Blinder or Pixel Mapped matrix for a stunning visual effect • Great for Stage Lighting, Bands or Night Clubs • 5 DMX channel modes: 3, 6, 7, 48 & 52 channel • Individual Pixel controllable in 48 & 52 channel DMX modes • 4x Pixel Flip options changes pixel orientation • 4x Operational modes: Auto, Sound Active, Manual RGB Dimmer, Static Color, and DMX-512 • RDM Compliant (Remote Device Management) • Built-In preset colors and programs • Flicker Free operation (No flickering on camera) • LED pulse and strobe effect • Electronic Dimming: 0 - 100% • 5 selectable Dim Curves (Standard, Stage, TV, Architectural & Theatre) • 60-degree beam angle • 3 & 5-pin XLR chassis mount connectors for DMX linking • PowerCon AC IN/OUT to daisy chain power (up to 5 Dotz Matrix's @ 120V and 9 Dotz Matrix's @ 230V on one 20 amp circuit ) • Power Draw: 430W total (All LED's @ Full) • 4-button DMX LCD display • Single yoke allows fixture to be mounted • Fan Cooled • Light Source: 16x 30-Watt COB TRI LEDs (RGB: 3 in 1) • Auto sensing power supply: AC 100V/60Hz - 240V/50Hz • Dimensions (LxWxH): 13.75” x 6.75” x 14.75”/ 345 x 170 x 370mm • Weight: 18 lbs. / 7.8 kgs.